The other night I took the boys on a geologist-guided hunt for glow-in-the-dark crystals! The collection site, near the summit of Tiger Mountain, is a logging road that sits on top of a small, ancient volcano. The logging trucks cause erosion and other environmental damage to the site, and this damage causes the buried crystals to be uncovered or broken off rocks crushed by the trucks’ wheels. We went there after dark and followed the logging road on foot using black lights powered by heavy battery packs. The black lights make the crystals glow! We found two types of calcite, one that glows whitish blue and another that glows red, and opal, which glows green. The boys had a great time, even our surly teenager, who had to be dragged along but admitted that running around with flashlights and black lights to search for glowing crystals on a mountainside at night was actually pretty cool. Especially since he had a friend with him. We also collected some coal and a piece of shale with a fossil of a magnolia leaf on it. The one downside was that the logging road was really muddy, and since it was dark and we needed the flashlights off most of the time to use the black lights, we often couldn’t see where the muddiest places were. Sometimes we’d sink in mud up to our ankles. So after we got home, I had to scrub everyone’s shoes by hand in the sink, then put them through the washing machine, then stuff them full of newspaper to dry overnight, then finish them off in the dryer. Here are the crystals I found. The boys each found more than me. They were like little monkeys, bounding all over the volcano. 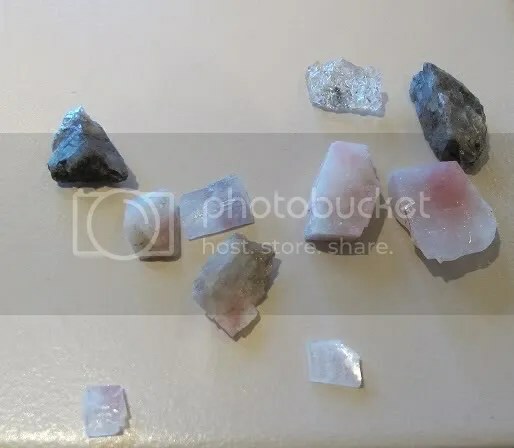 These are all calcite of various types except the clear one near the top right which is opal. Looks like an awesome start to a collection! I’ll keep this activity in mind for when my kids are a little older. Sounds like lots of fun. The closest I ever did to that was looking for salt crystals in Oklahoma. These are prettier. Thanks, it was fun! We are lucky, I think, to live in such a geologically active region (Washington state) where we can find crystals like this. Although my youngest son laments the fact that his back yard digs never yield any gold or diamonds.